In this fifth month of the project the sun is so much higher in the sky that lighting conditions throughout the day have changed considerably from conditions during the first month. This is very visible in the different orientations of the two standard perspectives from which I take pictures at every single visit. Perspective a faces pretty much due south, and the different times of day are mostly noticeable with the wandering shadow of the tree. Perspective b, on the other hand, faces pretty much due east, and pictures look very different depending on at which time of day they were taken. I will only show pictures taken from perspective b this month, passing from the earliest time in the morning to the latest time at night that I took throughout the month. Pictures don’t appear in strict chronological order of date here, but are arranged according to the time of day at which they were taken. May 19 , 9.35 a.m.
May 20 , 5.44 p.m. 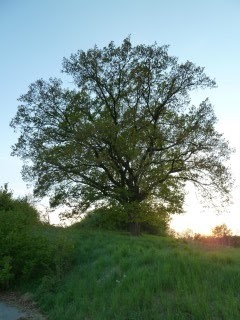 I also did a little more research on oaks with books that I took out of the local library, i.e. nothing seriously scientific. 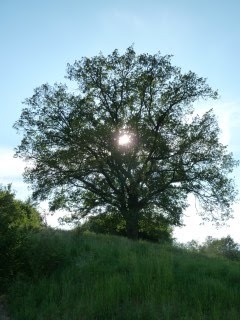 Thus I found out that oaks, as deciduous trees, are also called „enduring plants“ because they dispense of their leaves in the fall, reducing their metabolism, and giving the wood and roots the chance to outlast long and hard winters. 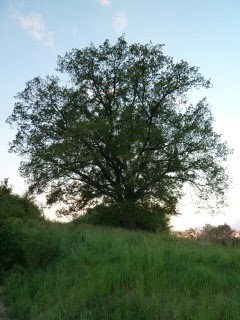 Of course I knew that with a new period of growth they will produce new leaves, increase their body of wood, and their volume of roots in the ground. However, I had not known that they need to be at least 40 or 50 years before they will start producing fruit, i.e. 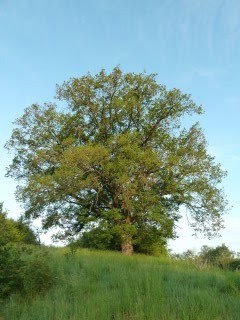 offspring, nor had I known that any (female) tree will produce fruit only every two to three years. 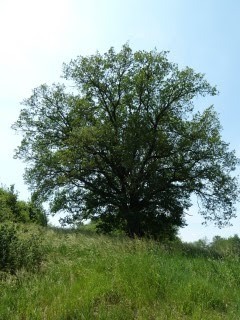 There are a few babies around my oak, but I haven’t taken pictures of them yet. 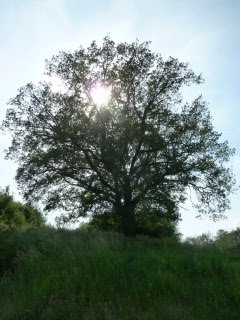 One statement that keeps recurring in any information on oak trees is that they offer „living environments for the highest numbers of organisms“. 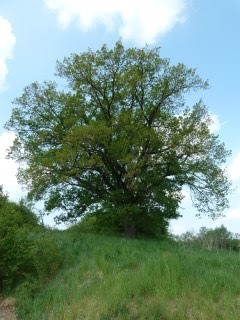 However, none of the books I have consulted so far has given more specific information on this – I would assume that this statement probably refers to woods that are made up of predominantly oak trees rather than a single tree in the landscape such as my oak is. 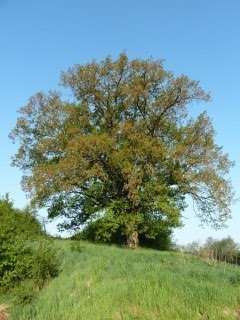 Given the right conditions in terms of soil, location, sunlight, water, etc., oaks can easily live up to 700 or 800 years. 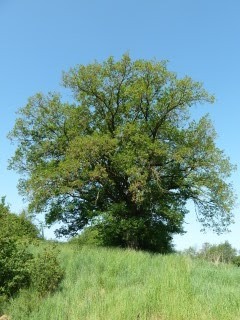 I will talk a bit more about the age of oak trees in my next report.